AxesSim has been contributing to many collaborative R&D projects – such as the well-known framework programme for research and innovation H2020 from the European Commission – which involve a significant part of challenges to take. Our contributions allow us to stay at the cutting edge of innovation in electromagnetic simulation combining the multitude of knowledge bricks available worldwide in order to respond efficiently to the needs of the customers. ANALYST project is placed in the context of Electric Wiring Interconnection System (EWIS), the installation directives and specifications that are provided by airframers (and that guaranties implicitly – if applied – that all sections of the applied standards will be verified: for example TDD- Technical Design Directives and SIDP-System Integration Design Principles routes). They concern the allocation of cables in bundles (segregation in routes depending on criticity), relative geometry of routes of bundles (spacing and height between routes,..), size of bundles. Those rules depend on the airframer and generally on the aircraft). In terms of declination we have for example for Airbus: CS25 → Subpart H → TDD → SIDP. • To help to for the design of cable networks → which requires sensitivity analysis capability. • To help to justify derogations to the installation rules → which requires lowering of margins capabilities → necessitating capabilities for precise estimation of “extreme cases” and their related “confidence level”. This objective requires to definitely consider the not-deterministic nature of the problem, looking for a statistical description of the relevant physical parameters (currents, voltages, power) linked to statistical descriptions of the involved geometrical/electrical variables/environment (cables, bundles, platform grounding features etc.). 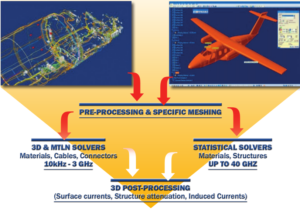 On such bases the ANALYST project aims at developing and demonstrating/validating a numerical modelling methodology based on statistical approaches for the specific context of EM compatibility analysis of cable-harnesses in aeronautics. • Integration of the finally selected modelling approach in CableSim, the AxesSim’s professional CAE Tool, already equipped with the workflows and procedures needed to properly manage (i.e. 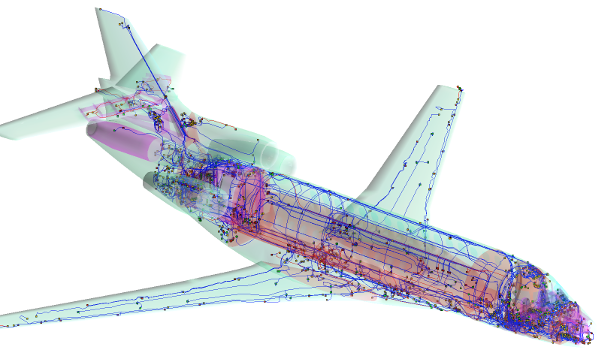 by considering a typical industrial approach) the complexity of a real aircraft application in order to be able to prove the accurate results of the project on real-life harness configurations. CHEERS deals with the EMC issues of Electric Wiring Interconnection System (EWIS) control in complex civil and military systems. 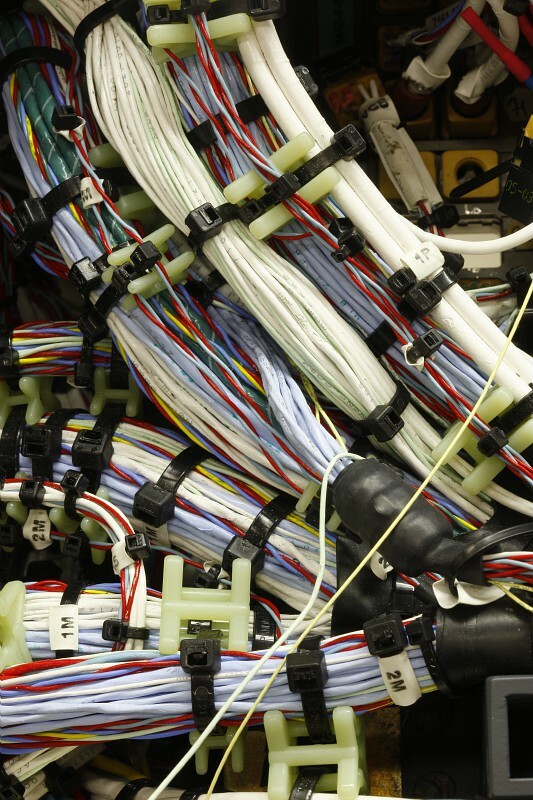 Wiring harnesses, connecting system devices, plays a major role in electromagnetic compatibility (EMC). To cope with the industrial challenges, it is important to model the cabling from the design phase in order to guarantee their design, or in the qualification phase in order to better control the margins and control the performance of the systems. Furthermore, electrical cables present a high variability of characteristics (the number of conductors can vary from one to over a hundred conductors, electrical wires can be insulated in dielectric sheath which cause a propagation speed change, cable wires can be twisted to decrease the susceptibility, …). Harness bundle inner sections are also merely controlled (relative location of cables in bundles) and add new uncertainties for the ECM evaluation. Taking into account all the uncertainties related to cabling, which condition the EMC margins of protection, is a highly innovative aspect of this project. 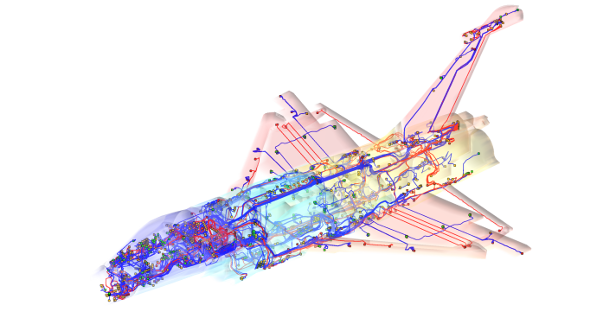 In order to validate all the methodological and software developments, experiments on realistic test cases and industrial complexity will be carried out on real cable harness provided by Dassault aviation. This validation work will make it possible to obtain tools that are widely validated and directly applicable to industrial configurations. Energy performance, safety and limited emissions are a priority for aircraft manufacturers and their supply chains. Composite lightweight materials, electrification of functions onboard aircraft and operations at higher altitude/latitude are parts of the fundamental levers for optimizing the performance of existing and future generations of aircraft. However, this results in the exacerbation of Electromagnetic (EM) hazards and exposure to Cosmic Radiations (CR) risks. Specific protection measures are therefore required to guarantee safe electrical systems, leading to weight penalty and jeopardizing the emergence of energy-efficient Composite Electric Aircraft (CEA). Hence, the development and optimization of electrical systems integration is crucial for CEA. The EPICEA project intends to release, validate and verify a computer environment (i.e. the EPICEA platform) compiling a complete understanding of Electromagnetic (EM) issues on Composite Electric Aircraft (CEA). This includes EM coupling on interconnects and Cosmic Radiations (CR) on electrical systems together with new concepts of antennas designed to maintain performance in composite environment without modifying aircraft aerodynamics. The EPICEA platform will support a decision making process for selection of the best strategy for the integration of electrical systems. Starting at Technology Readiness Level 3 (TRL3), the consortium will demonstrate a TRL4 at the end of the project. Research and technical activity in EPICEA is organized in 5 technical Work Packages (WP1 to WP5) framed by a WP for the dissemination and the exploitation (WP6) and a WP for the management of the project and the coordination of the Research, Innovation and Action (RIA). The project intends to release, validate and verify a single computer environment (i.e. the EPICEA platform, based upon CuToo framework developed by AxesSim) helping to understand EM issues on CEA. The initial ANR ASTRID CONFORME project made it possible to solve the problem of meshing in staircase to switch on a mesh conform to the geometry. The various techniques around the conform FDTD method have been studied. The important developments carried out in this framework led to the completion of a multi-region conform FDTD general solver and to the development of a method-specific compliant mesher. In addition, the oblique wires have inspired further studies to extend its capacities in non-uniform cartesian grids. In compliant cells, it was not possible to have the formalism operational for various reasons detailed in this maturation project. This is why we find this problematic at the heart of CONFORME2 with a new approach and a step back in order to better understand the complex problem of FDTD compliant wire-cell coupling. The maturation project CONFORME2 also proposes to turn up in TRL all the problematic modeling of the external / internal assemblies airplane by proposing original evolution at the levels of the FDTD solver CONFORME, the conforming mesher and the environment of pre- and post- treatments inherent to the method. The objective is to take into account the complexity of the aircraft geometry but also to consider the electromagnetic properties of the materials in the conformal method which was initially developed for perfectly conductive surfaces. The operational validation of the tools on CEM aircraft problems will be carried out thanks to the involvement of Dassault Aviation in this project which have all the elements of modeling EM aircraft and a database of results on both the indirect effects of lightning and HIRF constraints. Controlling performance of antennas installed on systems is a major industrial matter. – then to be considered jointly with the radio compatibility issue in order to secure systems mutual absence of disruption through antennas accesses. Wide increase of antennas on systems due to the multiplication of functions and connections leads to an increase of criticality of this situation. This Antipodes project addresses the management of antennas implanted on complex systems and the administration of their unit or collective performances. Generally speaking, this project deals with the treatment of a multi-scale issue (antenna / system) and wide frequency band (behavior in the band and outside the aerial functional band). This broadband approach to the problem calls for a method of resolution in the time domain, which is one of the innovative aspects of our approach. The objective of the project is to develop an industrial tool, complete and validated, firstly to anticipate and predict the performance of an aerial in its operational configuration (installed on the system) and then to evaluate the decoupling between aerials installed on the system. 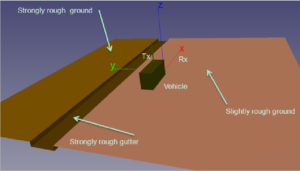 It is based on the implantation of a model of precise close-range radiation of each antenna within an electromagnetic modelling of a complex structure (aircraft, ship, building), granting very flexible use without any need to use a mesh and therefore leading to a knowledge of the antenna design. 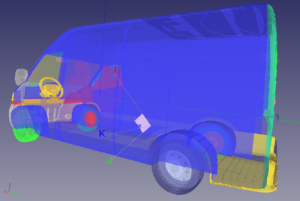 The objective of the MCIED2 project is to design a compact, directive and integrable VHF antenna on vehicle to improve contrast between signals from target and ground clutter and thus increase the probability of detection of radio anomalies.The transmission in VHF band results in a strong interaction between the antenna and the carrier. The study is conducted for two types of platforms : the first is military (operational platform) and the second is civil (test platform). The very different geometries of these platforms will allow us to apprehend a great diversity of scenario of interactions with the VHF antenna to be conceived. Applications include detection systems for the use of improvised explosive devices on the military side and self-protection for dual security applications of civilian and military vehicles. The design of such antennas is a scientific innovation and builds on the experience of the IETR and Thales in this field, connecting them around the concepts of compact broadband antennas and directives.The exploitation of ferrite-type materials is particularly planned in this context of targets detection. The control of design, development and validation relies on virtual prototyping and real-field measurements for operational validation. The methodology used to get a robust approach is a matter of industrial innovation.The feasibility study of the antenna is based on commercial codes (Feko, CST, HFSS), based on antenna simulations and its very close environment. The extraction of digital dipole models of antenna will allow a strong or weak hybridization with the 3D code FDTD TEMSI-FD to take into account the coupling with the platform. HOROCH (in french for “Utilisation des HPC pour l’Optimisation des Radiocommunications des Objets Connectés proches de l’Homme” is devoted to the development of a high performance computation simulation tool aiming at optimizing the wireless body area network (WBAN). The purpose is to be able to evaluate the effects of the human body on electromagnetic waves propagation with high accuracy to optimize and improve the wearable technology. This simulation tool is based upon the lastest research innovations in the electromagnetic simulation area. It embeds a Discontinuous Galerkin Time Domain solver (TETA) particularly powerful to study multi-scale systems, and highly optimized (OpenCL optimization on CPU and GPU) both for HPC clusters and classical work stations. 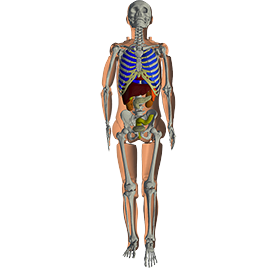 The preprocessing is performed by a specific environment that allows construction of models combining geometric precision and electromagnetic constraints, in particular inside and close to the human body. The aims of this project, relying on our partners Thales, Bodycap-medical http://bodycap-medical.com/ (miniaturized sensors for the medical sector) and Cityzen Sciences http://www.cityzensciences.fr/ (smart textile) is dual. In the first place to estimate the accuracy and the robustness of the methodology to assess the effects of the human body on electromagnetic waves propagation. In the second place, to evaluate finely the needs and expectations of the Wearable, Quantified-Self and i-Healthcare industries. The XLIM research institute has been developing a numerical calculation tool based on the finite difference method in the time domain (FDTD) for many years. This tool, distributed by AxesSim with its dedicated environment (CuToo-FD) makes it possible to treat the EMC of large systems. 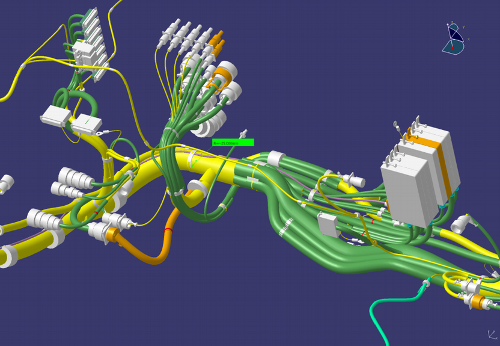 The CuToo-FD simulation environment has the particularity to possess a robust and performing model of diagonal wire developed by the XLIM Institute. This formalism has demonstrated all its robustness when taking into account a complete topology of Dassault Aviation’s Falcon 7X cables. As a result, we have shown that it is possible to deal with a single tool all the complexity of a structure such as an aircraft with an electromagnetic model projected on a cartesian grid and also including the wiring with a remarkable flexibility. Today’s challenge is to take into account the curved geometries in a most appropriate way. Indeed, the bundles of cables run along the walls so the estimation of the electromagnetic fields close to the walls is crucial. To do so, the Conforme project aims at using the FDTD techniques in order to avoid the projection in a Cartesian grid. Moreover to adapt the formalism of thin wires to allow them a close proximity to the compliant walls. Finally it is at taking into account the strong variations of fields strongly related to the static. 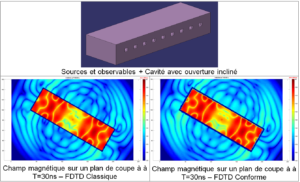 The aim of GREAT project is to develop and validate an industrial tool for electromagnetic simulation in time domain based on a Discontinuous Galerkin approach (DG methods). This calculation DG method and its implementation on GPU (Graphic Processing Units) are inherently innovative. Moreover, the development of hybrid meshing generator optimised for this method also represents a major progress of this project. The developped tool will consequently be very heterogeneous and useful in a wide range of application fields, responding to a large demand. Modern airframe design is exploiting new exciting developments in materials and structures to construct ever more efficient air vehicle. These developments are driven by the economics of fuel efficiency and environmental sustainability, and the competition between airframe manufacturers both in the developed world and increasingly in the developing world. The ElectroMagnetic environment in which air vehicles have to operate is becoming increasingly complex with developing threats arising outside the air vehicle and the demand from passengers to operate increasing numbers of diverse personal electronic devices within the cabin in flight. 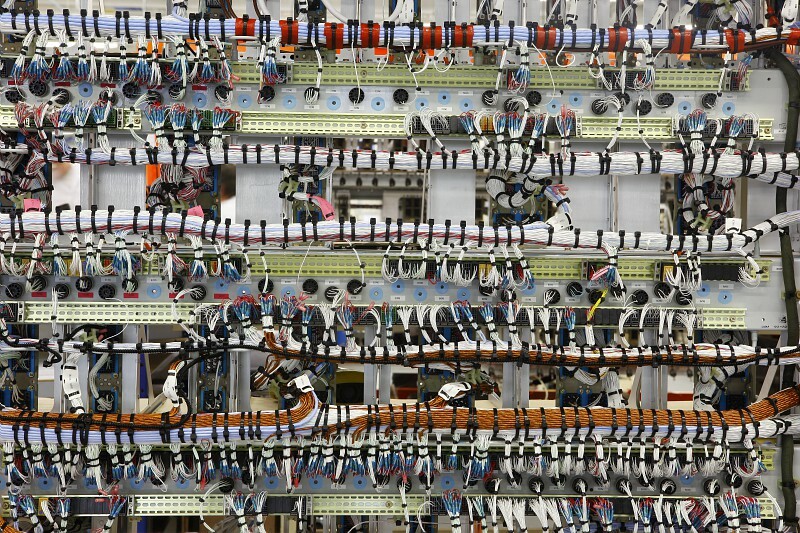 The HIRF SE project has the goal of providing the European aeronautics industry with a computational framework which can be used in the development phase to enable ElectroMagnetic aspects of the airframe design to be accounted for at an early stage of the design process. Currently much of this work has to be done at the test phase risking considerable re-work costs if problems arise. Application of the HIRF SE framework will thus confer a substantial economic benefit. In addition it will provide a considerable reduction in the certification and qualification tests required on an air vehicle. This proposal has brought together a large community of airframe manufacturers, research institutes and universities all with significant expertise in the aeronautics applications of ElectroMagnetics. The consortium has significant membership from recent accession states. The expected results to be included in the computational framework are summarised as follows. – Capability to deal with the increased use of composite materials and structures by the airframe industry. 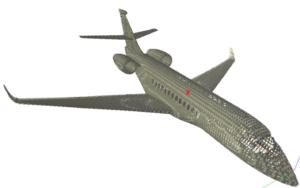 The HIRF SE framework will include the most advanced computational models for the numerical simulation of the EM characteristics and performance of composite materials. – Capability to deal with the complete internal and external electromagnetic environment (present and foreseen). The HIRF SE framework will be able to simulate a wide spread typology and number of EM (internal and external) interference sources. – A developed methodology and tool well recognised inside the civil aviation community in accordance with the certification bodies. The HIRF-SE framework (CuToo), developed by AxesSim, is a collaborative work platform that is primarily designed for managing scientific data and computations. CuToo enables to use all simulation software provided by the partners and plugged in the the HIRF-SE platform in consistency with the certification process defined by airframe manufacturers.